An easy game wasn't expected, but Andreu Plaza's side won their first match of the Elite Round with a double from Adolfo and further goals from Ferrao, Dyego, Aicardo and Lozano. 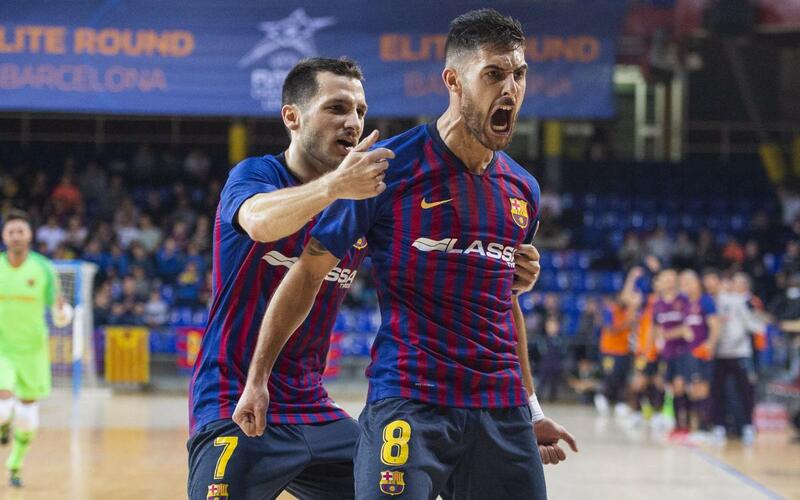 Barça Lassa comfortably defeated Ekonomac 6-1 in the first game of the Elite Round. Adolfo's double as well as goals from Ferrao, Dyego, Aicardo and Lozano made it possible against the tough Serbian outfit. The hosts didn’t take long to lift the 2,784 spectators who came to the Palau. Adolfo, who is in exceptional form, opened the scoring with a shot from distance (1-0, min 5). Ferrao quickly added number two before Divanel pulled one back for the visitors (2-1, min 10). Dyego, after a fine one-two with Ferrao, sent the ball into the bottom corner (3-1, min 13), extending Barça’s lead once more. An electric first period of play ended just after Adolfo had taken the blaugranes even further ahead (4-1, min 18). The Palau had already been enthralled but a good result soon became a great one. Aicardo put Barça 5-1 up on 22, and though Ekonomac rallied, they were unable to get back into the game. As they tired, Lozano put the icing on the cake (6-1, min 35). Barça: Juanjo, Aicardo, Dyego, Adolfo, Esquerdinha –starters- Lozano, Leo Santana, Arthur, Ferrao, Boyis. Ekonomac: Antonic, Peric, Igor, Divanei, Thales –starters- Rnic, Da Silva, Rajcevic, Sorokin, Matijevic. Goals: 1-0, Adolfo (min 5). 2-0, Ferrao (min 8). 2-1, Divanei (min 10). 3-1, Dyego (min 13). 4-1, Adolfo (min 18). 5-1, Aicardo (min 22). 6-1, Lozano (min 35). Officials: Eduardo Fernandes Coelho, Miguel Castilho. Yellow cards for Igor and Thales. Attendance: 2,784 spectators at the Palau Blaugrana.